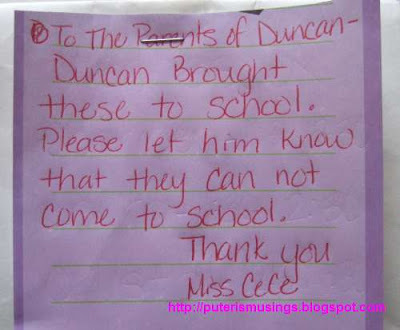 The day before I found this note stapled to an envelope on Duncan's page of the sign in/out book at my kids' preschool. I immediately suspected what was inside because the previous morning, he had one of those items in his hands. I had told him not bring it to school because it was possible that those items were not allowed. But Duncan said, "Me put it in my pocket. Me not let Teacher see it. " Yeah, right. So it wasn't much of a surprise when I saw the note and envelope in the sign in/out book at the end of the following day. Yes, he brought two small spent shells to school. I thought he only had one. The shells were only about half an inch long. They were the spent shells that Duncan collected after our target shooting outing recently. According to the teacher, he was proudly showing the shells to the kids in school. Duncan had wanted to bring a few of his toy guns to school previously. Toy guns are absolutely banned from school. In some schools, kids are not even allowed to put their fingers in a gun pointing position and point them at someone. They could get suspended just for doing that. Definitely no cops and robbers games allowed at school. puteri, amat lucu ur baby boy nya. hehe. madah ka nyimpan dalam poket jak, tapi ngeso agai bala kawan2 gak tai nya. hehe.Tapi aku salute la school nya laban banned utai ke berkaitan enggau senapang tauka pistol. Jadi kuranglah jenayah di masa hadapan kot. Ya, better becareful. Ur hubby talked to ur son about it? Anak aku nya, samoa ulih dipromise tapi jako aja .. bedau entu nemu utai. Schools ditu are drug free and gun free zones .. ko jako lah, ulih ga sekeda mai senapang alu nimbak bala classmates .. enti udah gila, enda ulih tagang. We just told him things like that cannot be brought to school. My fault also, because I knew he brought it to school. I didn't expect him to show it to everybody. He has all kinds of things in his pockets and I don't always know what are in his pockets. mmmhh. kala aku ninga rita betembak nya. macam2 neh..
Haha, Ian, already spent, kosong lah, how to explode again! :-) Those days quite ignorant, eh. 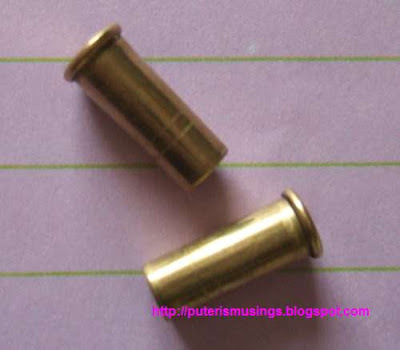 We used to play with our father's spend shotgun cartridges too .. we knew they were empty, so couldn't hurt us. Anyway, since it's a "hot" issue in the US, especially with so many cases of shootings in school, gerenti panas one lah.